President Trump met with Queen Elizabeth II of Great Britain at Windsor Castle on Friday. 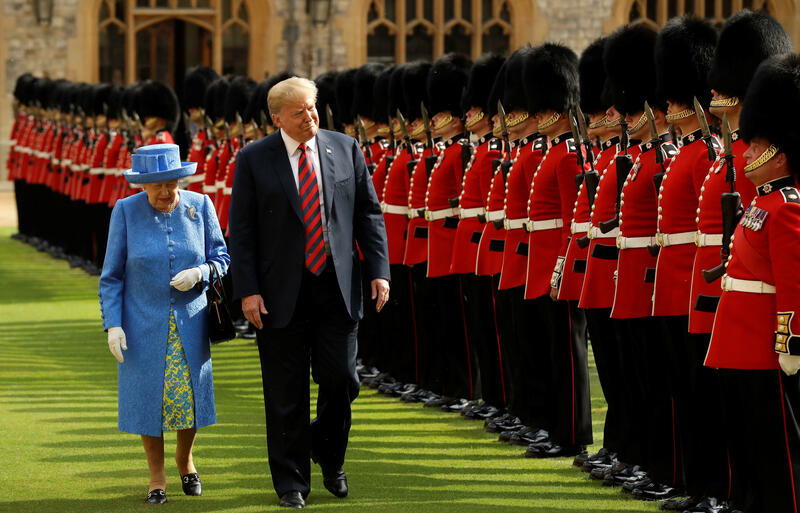 This was Mr. Trump's first official meeting with the British monarch, who has met nearly every single one of the last 12 American presidents since the 1950s. Before meeting the queen, he called her an "incredible woman" and said he was excited to meet with her. After their motorcade pulled up into a courtyard of the castle where the queen was waiting, Mr. Trump and first lady Melania Trump were treated to a rendition of the U.S. national anthem. Then Mr. Trump and the queen inspected her guard of honor as the troops stood at attention in their distinctive uniforms. The Trumps and the queen then walked inside for a private tea together. Scheduled for 30 minutes, the meeting ended up lasting longer as the three visited for 47 minutes. CBSN royal contributor Victoria Arbiter said that from the moment of his arrival, it looked like President Trump was "on his best manners." "He's talked about his respect for [the queen], he's talked about how much of a fan Melania is, he's even talked about the fact that his mother really adored the queen, so I think he would have wanted to make a good impression," Arbiter said. Several official photos released afterwards showed the Trumps standing on either side of Queen Elizabeth in the richly decorated Grand Corridor of Windsor Castle. Following the tea, the president and first lady departed for a private weekend at the Trump Turnberry golf club in Scotland. The president's visit to Great Britain, which comes after the NATO meeting in Belgium and before Mr. Trump meets with Russian leader Vladimir Putin in Helsinki, Finland, on Monday, has not been without its share of controversy. Mr. Trump, who was greeted by massive protests in London, criticized UK Prime Minister Theresa May in an interview published Thursday in The Sun, a British tabloid, over her handling of Brexit. Mr. Trump complemented Boris Johnson, who resigned earlier this week from May's cabinet over disputes about Brexit negotiations, saying Johnson would be an excellent prime minister. May and Mr. Trump then attempted to mend fences during a Friday press conference in which the president complimented the prime minister at length and dismissed reports of his criticism as "fake news." "I think she's a terrific woman," Mr. Trump told reporters at the joint press conference. However, royal observers say the queen's meeting with Mr. Trump is likely to be anything but tumultuous. A practiced diplomat, Queen Elizabeth has sat on the throne since 1952, and is used to receiving foreign leaders with big personalities. "They actually have quite a lot in common," royal biographer Robert Hardman told "CBS This Morning" about Mr. Trump and the queen. "They both got Scottish mothers, they both own fairly large parts of Scotland – in her case Balmoral [and] in his case two golf courses – and she's used to dealing with the most appalling despots, monsters, crooks, dictators. I think they're going to get on great."